August 2016 was developing as another wet month after a very wet July. Following one of the driest and hottest years on record I was amazed at how quickly I had forgotten the stress from the constant threat of bushfire in those parched months before it rained. Yet here I was talking to farmer Bill on his verdant soggy paddock at the Dog Rocks on a rainy day, enduring a lazy wind that added a chill to the grey-green melancholy scene. Was it last summer that was dry or was it the year before? My memories were being confused by the absolute and expeditious transformation of this landscape from desolate and threatening to productive and nurturing. Dog Rocks is part of the impressive landscape that defines areas around Geelong, Victoria. Ancient super-hard granite tors, bleached bone colour by the sun, sometimes as big a small house, laid bare after by 350 million years of constant weathering. These strewn chaotic boulders stand out as the only elevated feature on the flat basalt plains to the west. They are the surface expression of something huge underground that reaches up through the earth’s crust. They’re just the tip of a rocky iceberg. Bill had rare trees on his property that I had been wanting to see for about a year. I had met him at an event at the nearby sanctuary a year ago and was intrigued when he told me that he had remnant Silver Banksia growing on his property nearby. Whether it was a bad case of “I'll get around to it" or perhaps a low priority in the context of running a small business or a combination of both, the end result was that I didn't get to see them. Disappointingly it had taken an invitation from Bill to design a boundary plantation that motivated me to be there on this day. Bill had finished explaining the important features that he wanted in his eight row plantation when I enthusiastically added that it will be great to plant some new Banksias in this plantation to support his remnant old trees. "By the way" I said, if they're close by, can I have a look. Bill shuffled a little and exclaimed with his eyes fixed on the wet ground in front "It's only one Banksia and I think it's on its last legs". We walked the hundred meters or so and stood before a wonderful old tree. A tree that had survived for several hundred years of winter cold and extreme summer heat, a tree that was 12m tall which is tall for a Silver Banksia, a tree that looked so solid and resistant to the passage of time, a tree that did appear to be 'on its last legs’ because it had lost all of its leaves which is not a good sign for an evergreen tree. I asked Bill if he know of any other Silver Banksia trees in the Dog Rocks area and he just shook his head. That uncomfortable empty feeling of arriving somewhere too late to enjoy a long anticipated event washed over me. Had I turned up just in time to witness the death of the last Silver Banksia? Granite occupies a considerable portion of the area of the colony, forming larger and smaller isolated tracts and massives…. 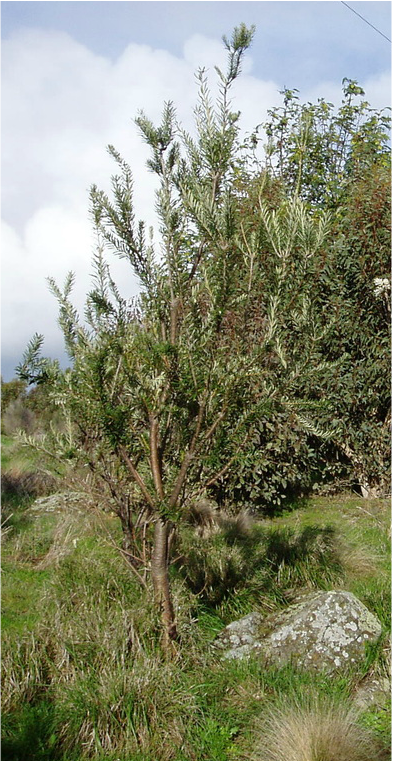 The higher points and spurs are in most cases quite bare, or support but a poor forest-growth of gum-tree (Eucalyptus), and, as specially characteristic, of she-oak (Casuarina) and honeysuckle (Banksia). yellow candle flowers. Its natural home is quite widespread, extending from the Eyre Peninsular in South Australia throughout southern and central Victoria and into NSW as far north as Armidale. It's an adaptable tree that will grow in most well drained soils. It's a tree that is larger than life giving character to any landscape because of its enduring solidness. Even young trees look ancient, paddock bonsai's, twisted and gnarled, never straight. Aside from this timeless quality, their yellow flowers are large and showy and full of sweet honey flavoured nectar much to the delight of the honeyeaters, parrots and possums of our bush. A young Silver Banksia. It could go on to live well over 100 years. 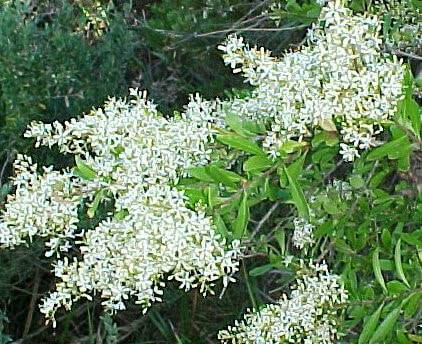 The first Australians soaked the flowers in water to sweeten drinks for children and to make a slightly alcoholic drink for adults. The dry cones of the Silver Banksia were used as strainers and to transport fire as smouldering cones from place to place. Kangaroos and possums are known to get tipsy on old flowers that have begun to ferment, getting a bad case of the staggers after over indulging. Unfortunately for the Silver Banksia, our early settlers didn't see it as useful, which lead to its pernicious disappearance from our landscape in all states. As Ecologist Ian Lunt writes in his popular blog, 'The woodlands of honeysuckle and oak disappeared as the trees fed the stoves and the seedlings fed the sheep of the new colonists'. Standing in front of the old Banksia I followed a very large root emerging from its trunk, half buried and half exposed. It seemed to be reaching out to me and saying ‘I'm not done with this world yet’. I bent down and felt the firmness of the bark. A dying tree will often shed its bark and like a mangy fox, look patchy and unhealthy. There was none of this to be seen even when I examined its trunk. There was some small evidence of sawdust suggesting a borer of some kind, but the bark looked like the bark of a healthy tree, showing no signs detaching. I said farewell to Bill after encouraging to him that he fence off an area around the old tree, so that any fallen seed would have a chance to germinate and grow into young banksias. I promised myself that I would return to visit this ancient Australian, very confident that I would see it sprouting fresh healthy leaves once the winter was ended and the warm spring begins enticing obstinate leaf cells to regenerate. A change in season will I hope invigorating this respected elder, a rare and endangered reminder for us of a past when nature was honoured and esteemed. This Silver Banksia had survived centuries of our fickle and harsh climate, surly it would 'thumb its nose' at the hottest and driest year on record and 'just get on with it' as it had always done. Barrabool Hills vegetation Part 4> Drooping Sheoaks adorned the Hills.